Giongco said Pacquiao likened Spence to Lehlo Ledwabah, defending South African world super bantamweight champion—“Hindi naman masyadong malakas”-- whom Pacquiao annihilated in his US debut in 2001. Many observers could find the five-feet-ten Spence too big and powerful for Pacquiao. There might be something Roach had seen which could have escaped Team Pacquiao. 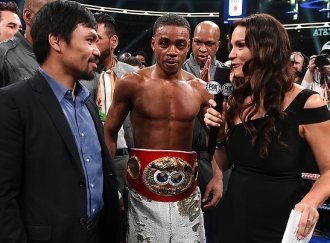 Spence, 29, is the IBF 147-lbs champion, while Pacquiao, 40, owns the WBA regular welterweight title. Photo: Manny Pacquiao (L) being interviewed by a FOX anchor after Errol Spence (C) defeated Mikey Garcia in Texas on Saturday, March 16.